On my recent trip to the US, I flew Air India in business class from Ahmedabad to New York’s Newark airport via London. The Port Lounge is the sole lounge at Ahmedabad’s international terminal and as such is used as the contract lounge for all the carriers flying out of the terminal. 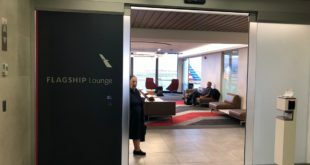 The lounge is located on the departure level after security. 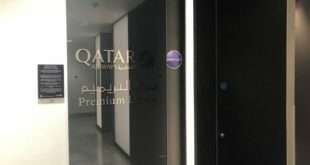 The lounge is accessible to invited passengers of the airlines. It can also be accessed as part of various credit card and lounge programs, including priority pass, dinners club and mastercard. The entry of the lounge is a shady looking restaurant. 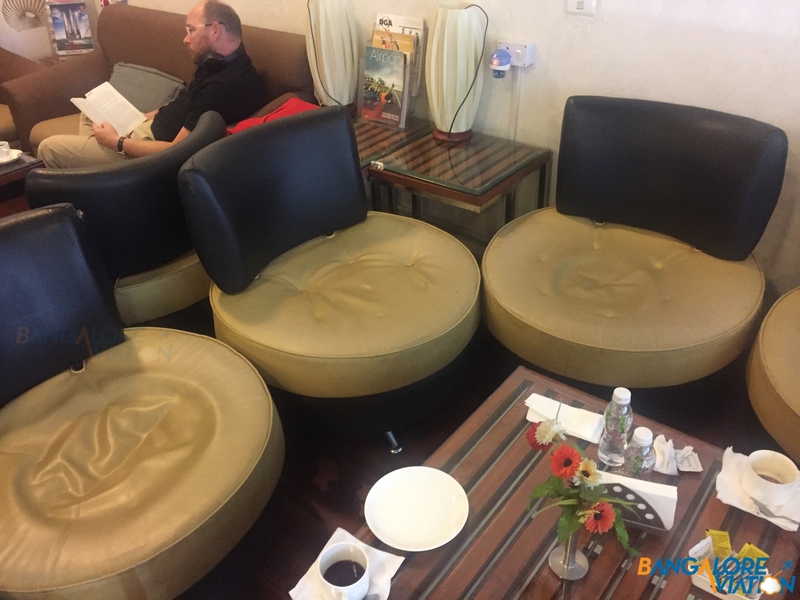 The lounge itself is a small rectangular room accessed from the back of the restaurant. The lounge has a variety of sofa squeezed together in dense clusters around tables. The sofas were all worn out and sunk in when sat on. The tables at the lounge were dirty. Along one wall was a table with food. 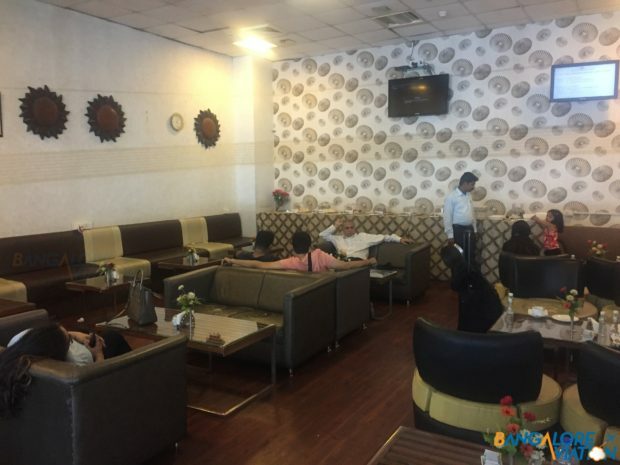 Almost the entire port lounge in Ahmedabad. A sofa cluster at the lounge. 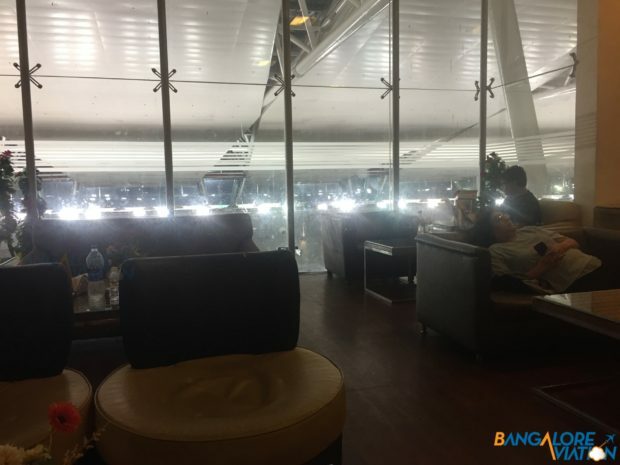 A particularly irritating aspect of this lounge was that lights from the check-in hall on the lower floor shone in through the window. Passengers facing the window are treated to helping of glare in their eyes. The glare from the departure hall below. Food was laid out along one wall on a table. There were a selection of sandwiches and some cookies. I didn’t eat any of the food, so I cannot comment on if it was any good. The buffet at the port lounge. Little bottles of water were placed next to the food but no other soft drinks, etc were available in the lounge. After about 10 minutes of me entering the lounge, an attendant came up to me and asked if I would like coffee. He quickly brought me a cup of coffee which tasted decent. The lounge was pretty warm and also lacked plug points. I left the lounge after just a short while since the terminal was much cooler and there were some plug points round to charge my laptop. I found a plug point near a chair which also gave me a view of the ramp outside the window. The port lounge may be the worst lounge I have used in the recent past. It is cramped and dirty. 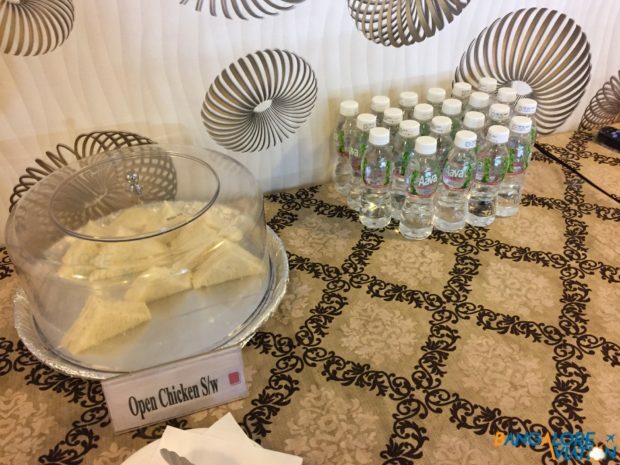 The food and beverage selection definitely leaves a lot to be desired. 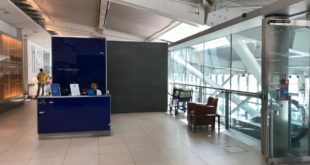 My suggestion is if you are flying business class, have access to the lounge through an airlines loyalty program or have a credit card with unlimited lounge accesses, step in and grab some water – since like all airport’s water bottles are horribly overpriced in the terminal. But if your credit card program has limited entries to lounges, I would definitely not waste one here.